We backed Unfair by Good Games on Kickstarter having no idea what it would be like. But any game that shows a roller coaster on the box is my type of game! I’ll get right to the point of this review: Unfair is a really fun game. Now for some details and some pros and cons. The game is a card collecting game of sorts. But not like deck building games where you use some type of action to give yourself better cards in your hand. I haven’t played deck building games other than a few rounds of Dominion and it is nothing like that. But it’s not a board game either. it is a little bit like 7-Wonders and Sushi-Go in that you are trying to make sets of cards that go together in useful ways. but unlike those games, the mechanics of how you gets cards is very different. When we opened the box, we found that it was much bigger than needed. There is room for more sets of cards to be added later. 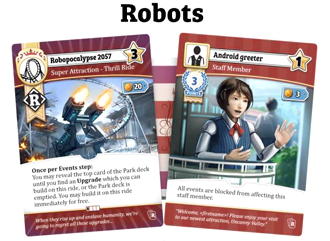 Cards are in sets that each have a theme park “theme.” The different sets have a variety of strategy and difficulty. The sets have a bunch of different types of cards, and once the appropriate number of theme decks are picked (based on player count), cards from each deck are combined and shuffled into decks of the different card types. We discovered, hopefully correctly, that the theme decks that the cards came from means nothing during play. More on that later. 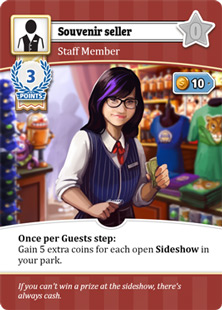 The types of cards are Park cards, Event cards, Blueprint cards, and a few others. There are lot of park cards, a lesser number of Event cards, and lesser still of the others. Each player gets the one Main gate card of the theme that they want (from one of the theme decks picked for the game). I won’t describe the entire game in this review; suffice to say that there are other things to do in the game than the few things I describe here. Players have a bit of game money to start with and anything thing that is built in the park and any employees, need to be paid for. So onto the play. The starting player changes each round. There are typically 8 rounds to play. In order form the start player, each player takes an event card and saves it for a moment. 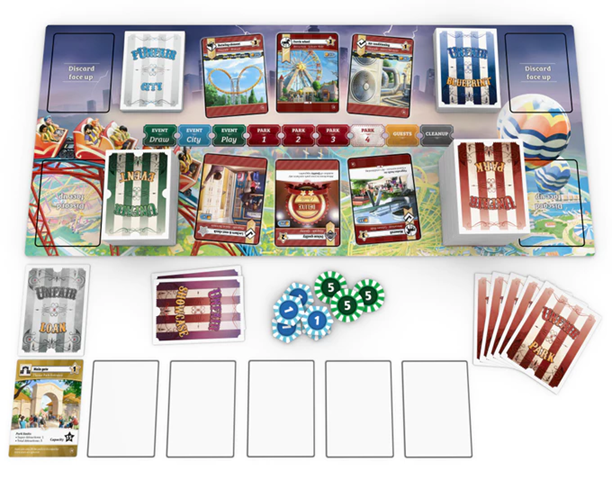 Then one City card is drawn that has a global effect for the rest of this round. The City cards are just a way to throw in some random changes that affect all players. The players then in turn order play event cards until all players are done playing as many events as they want. This is an interesting part of the game because the event cards almost always have two options, one that affects the player that played it, and one that lets the player affect someone else. Simply put, there is an event card that lets you take half of someone else’s money if you want to play it that way. My family doesn’t do that sort of thing much. Play continues with three or four sets of Park card plays. This part of the game is where you buy or build stuff in your park, or hire staff. 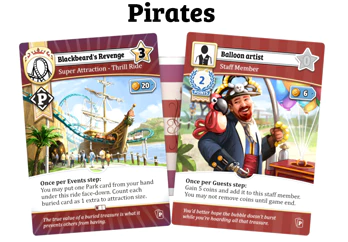 All of the things you can build, including new attractions or upgrades, as well as staff you can hire, are in the form of Park cards. During these Park steps, you can also get new Event cards as well as Blueprint cards. Blueprint cards describe plans for your park that if you meet them, you get a bonus. Failing results is some points lost, so it’s not always wise to pick a really difficult Blueprint card. 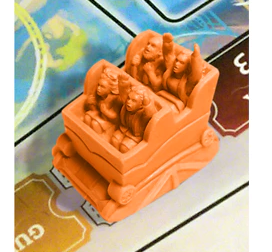 After the three or four steps of dealing with park stuff, players essentially count guests in their part and add up bonuses to get more money. there are then some cleanup steps, like all players discarding cards if they have too many, and then the starting player changes and the next round is played. My family has thoroughly enjoyed the game. Although we don’t play events that hurt other players (too often), the game doesn’t feel like group solitaire at all. 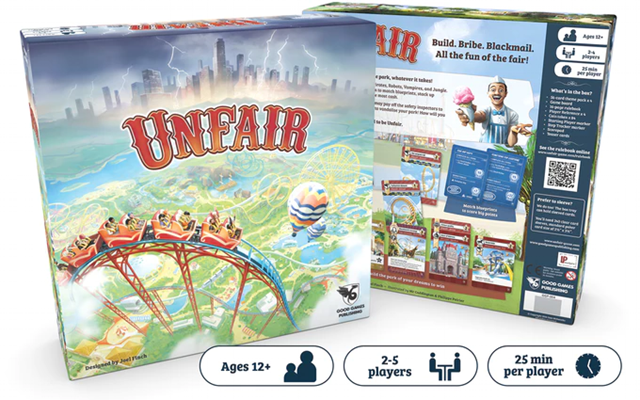 The amusement park theme of the game fits with our like of amusement parks and the game is well designed and plays well enough that we stopped looking up instructions after the first one or two games. As a contrast, we still sometimes get out the instruction book for Firefly: The Game. But there has to be something wrong with the game, right? Well, there are very few unclear instructions. In the setup, one step mentioned placing some City cards into a temporary pile. temporary? What does that even mean? it means that you are making a City card deck/pile and that you need to just start that deck/pile with some red city cards. There is a single other cards added into that deck/pile and then four blue City cards are placed on top of that. The word “temporary” didn’t make any sense because that deck or pile of cards isn’t temporary, it gets used in the game. Or maybe I just read it wrong. What else is wrong? The instructions didn’t make it clear that the tiny theme icon in the lower right corner of each card is only there for you to sort the cards back into theme decks when the game is done. They don’t means anything during game play (although each player does get to pick which theme they use for their Main gate card, Loan card, and cheat-sheet card). It is only the large icons in the upper left of each card that have any meaning related to theme during the game (and other stuff depending on the icon). Oh, and the different theme decks are not all cut on the same card cutting machine so some of the decks didn’t shuffle together easily. Those are really moot points since we figured out that stuff during the first game and we were sure about all that by the end of the second. And there are many ways to shuffle a deck if needed. The game is very pretty, well designed, and has a very usable board in relation to the space you need for laying out the cards that you play. The instructions are awesome compared to some games that I have. Play is competitive and very well paced. Siskel and Ebert would give it two thumbs up. If it were a hotel, it would be a five star hotel.